It has been a while since I have done a tutorial on the "HBT blog" so I thought I would share a "Kettle- cleaning tutorial" that has been handed down through the generations in our family. My grandma first showed my mother how to do it and it was sooooo good I still do it today! It's hard not to spot the safety-yellow coloured Berri Lemon juice (since 1942) above but I can assure you this is not a sponsored post on behalf of Berri. It's just berri good ok ;-). Ha, no seriously, I am sharing it because I've been doing a little spring cleaning of late (go figure??) and thought if ever I had a trick worth sharing this might be it; it really works a treat on kettle/ teapot scale without using any harsh chemicals. For the record I have tried to be all hippie and use just plain lemon juice but it does not work, at all. You need to use the real lemon squeeze concentrate! Pour Lemon squeeze directly into your kettle at least 2cm deep, swirl it around and close the lid. Pour a small amount of the squeeze into a small porcelain dish. 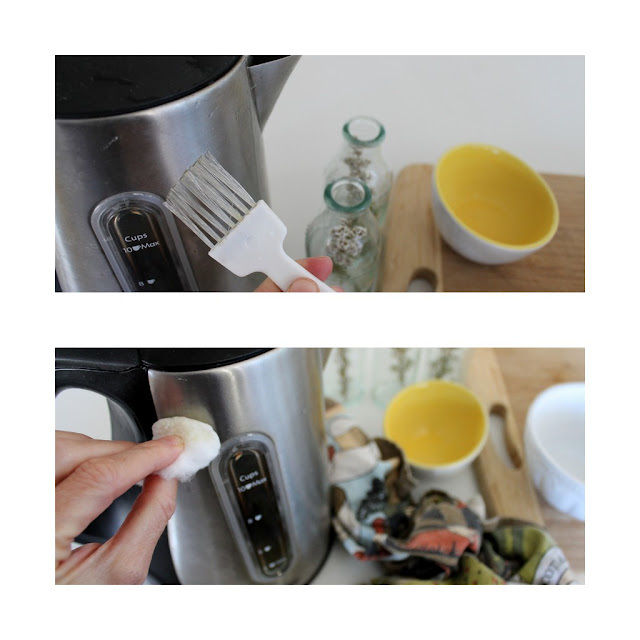 Using a brush or cotton wool bud, also clean the outside of your kettle. This will remove any build-up and also make it look shiny and happy again. Don't forget to swirl the lemon squeeze around regularly inside your jug so that it will reach the areas up high. Leave your lemon squeeze inside your kettle/ teapot for 1-2 hours, this is mine already looking very shiny after about 1 hour. You can even leave it overnight if you would like. When happy with the look of your kettle; rinse and boil your kettle a few times over to remove any lemon squeeze residue. Do you too have any spring cleaning tricks that have been handed down through your family? great tip rachel! i've never known how to clean a kettle properly. That looks terrific but you have reminded me never to eat the stuff. If it does that to a kettle, what must it do to a digestive system. The limescale in London was terrible. I used to use white vinegar to get it off. Like your lemon concentrate tip.